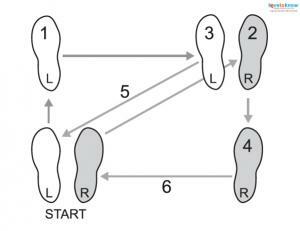 A rumba dance step diagram can help you get an idea of how to perform the basic steps to this sensual dance. Diagrams are easy to find, easy to understand, and can have you moving on the dance floor in no time at all. Regardless of where you find the rumba dance step diagram, it's going to look something like the one at Dancing4Beginners. The first diagram shows footprints for the lead, in sequence. The start position is with the feet together and the weight balanced. The left foot is white and the right foot is a gray shaded color to help differentiate them. Since the first step (with the foot labeled "1") is forward with the left, weight needs to be shifted to the right foot as the left steps forward. The second step is with the right (darker) foot, slightly wider than shoulders-width apart, to the right. Step number three is to bring the left foot over next to the right, and shift weight to that foot. The right foot is step four, and in the diagram it steps directly back, bearing weight. A long diagonal arrow has step five, which is the left foot returning to the original position. 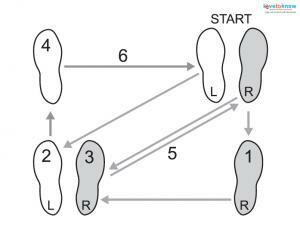 The final step of the rumba box step is to bring the right foot next to the left, returning to the "start" position and preparing to repeat the entire sequence. While there are also similar diagrams for the follow, they really are so similar to the lead's diagram that they are unnecessary. Where the lead steps forward, the follow steps back with the parallel foot, and vice versa. The basic step is so easy to learn it is no wonder it became so popular with dancers worldwide. There is a lot more information on the rumba, as well as another diagram, at the very thorough site StreetSwing. While they are useful for footwork, dance step diagrams suffer from one tragic flaw: they only show the feet. Even when directions such as "begin in basic dance frame" are included, the changes in the way the bodies move together cannot be learned from a piece of paper. Another integral part of the rumba is the rolling of the hips known as "Cuban motion." This is actually one of the hardest aspects of the dance to really get right. A diagram can't really teach it, and even videos such as the one at eHow can't really do more than show it. The best way to learn Cuban motion (and every other kind of dance) is to go to a teacher who can work with you one-on-one and let you know exactly how your hips are supposed to move. You might also just go to a Latin dance club and be lucky enough to find a partner who will work with you. Observing experienced dancers on the floor can really get your own technique off to a good start. As with any kind of dance, the key to doing it well is practice, patience, and passion. Remember that from the most basic step to the most complex choreography, the purpose of the dance is to have fun with your partner.